It’s not always easy to find something nutritious to eat in central London, especially when you’re bombarded with junk food and coffee shops on every corner. With summer fast approaching, we’re all a little bit more aware of our waistline, so here are my top picks of the healthy options that are also easy to find – whether you’re in a hurry or have time to kill. One of several salad bar chains in London, this is top of the list for a nutritious lunch. Get a salad made freshly to your specifications, right in front of your eyes. They also have a range of house salads to choose from, as well as soups, sandwiches and tasty looking ‘hot boxes’ that include stews and salads. There are 11 branches across central London and a typical salad will set you back about £6. To make life even easier, they also have a ‘salad builder’ on their website which lets you see exactly how many calories your salad will be in advance. These guys pride themselves on creating fresh, healthy, seasonal food, with a sustainable ethos. They really pick up on diet trends too, so you’ll find a good option here if you’re looking for a tasty lunch within your permitted allowance. Calorie information is displayed in store, making it super easy to make an informed choice and not ruin your bikini plan. My top picks are the Slow Burner salad and the Thai Green curry for a naughty but nice treat. A Japanese fast-food chain, Itsu offer a wide range of tasty sushi as well as serving hot food at lunchtime. All of their options are tasty, but low in fat and calories, meaning you feel full and satisfied without the need for stodge. They also do fab frozen yoghurt if you fancy a treat, but be warned – it’s a bit tart on the palette! This tapas style Mexican restaurant chain was started by Thomasina Meyers, a previous Masterchef winner. Mexican may not seem that healthy, but when presented in tapas size portions you can make informed choices about what you’re eating. There’s a good variety for vegetarians and not everything is covered in cheese! They recommend 2-3 plates per person, but for a lighter lunch it’s more than enough to share that between two. Look out for their Pork Pibil tacos, and some of the best guacamole ever. A Vietnamese restaurant, this gem offers a range of meal-sized soups and noodle dishes, made fresh and to authentic recipes. It’s perfect for a hearty, healthy meal and the service is usually pretty quick if you’re in a rush. They have 6 restaurants around central London, including one just behind Topshop on Oxford Circus – perfect for a mid-shopping energy boost. Both of these may seem unlikely choices for a healthy meal, but both chains have really made an effort to capitalise on the healthy diner. You can feast on ‘500 calorie’ pizzas at both restaurants (made with a thinner base,) plus Pizza Hut also offer a free salad bowl with every meal. Pizza Express have also recently launched a gluten free range, so one to look out for if you have specific dietary requirements. 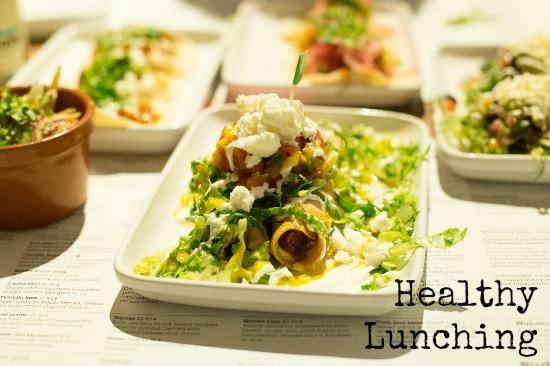 What are your favourite healthy lunch spots in London? Have you been to any of the above for a tasty meal and loved it? Ohhhh although high in calories the 'Nachos Grande' is delicious!! Its also super good for you with all that avocado and will keep you full for the rest of the day so less calories consumed overall – everyone's a winner! – ps i swap the chicken for grilled veg to make it even more nutritious! M&S are always a great back up – I love their fuller longer range. Really does keep you full! Loved reading this blog post, I saw the picture of Wahaca food and dived straight into this 😉 it's my favourite place to eat; there are some suggestions here that I've not thought of before so will give these a try too. I love eating out at any sort of Lebanese restaurant in London, the food is always fresh, tasty and usually lower in calories than some other places. Wahaca is my favourite. I make all my friends go just to get the guacamole! I hadn't thought of Lebanese before – will have to give that a try.